The location: The Golf Course. A. A golf course and country club. To create the illusion, we are first shown establishing shots (aerial views) of two real golf courses in Newport: the Pelican Hill Country Club (seen in the photo to the right) and the Big Canyon Country Club. Both have green fairways interwoven with those trademark, red tile-roofed homes. However, neither of them is actually used for the golf scenes (with the characters on the show). A. Many times, including episodes Episode 5 (of season one), "The Outsider": in which Jimmy & Sandy golf while discussing Jimmy's impending legal troubles; Episode 21 (of season one), "The Goodbye Girl": where Sandy golfs with a former co-worker at the Prosecutor's Office to discuss Jimmy's chances; and Episode 16 (of season two), "Blaze of Glory", where Sandy golfs with Kirsten. A. Three different locations, including two real golf courses and a South Bay park. A. The only real golf course they used most often is the Trump National Golf Club, at 1 Ocean Trails, in Palos Verdes, the same course which has been used for several of the Country Club scenes and at least one restaurant scene. The Trump course can be clearly seen in the episode, "The Outsider" (see the photo below). The course is open to the public, so you can golf there too (if you have $300 a day to pay the golf fees). Or you may prefer to just have lunch in one of the country club restaurants - with a great ocean view. Here is a map link to the Trump golf course. The second location was faked, using a local park to stand in for a golf course. We saw that in the Episode 21 of the first season, "The Goodbye Girl", where Sandy Cohen meets with a former associate from the Prosecutor's Office to discuss the case against Caleb's Newport Group (see the photos below). They are supposed to be out on the golf course. But that golf scene was actually shot up in Angels Gate Park, a public park located at 3601 S. Gaffey Street, in the hills of southwest San Pedro (near the Palos Verdes border). This hilltop park offers a nice view of the blue ocean, which is what lured the producers here (lots of green grass plus the ocean in the background is all they really need to fake a Newport golf scene). The park also contains the unique Korean Friendship Bell , an ornate, Asian temple-like monument which has been used in a few films, most notably "The Usual Suspects". The golf scene was shot on the lawn just to the northwest of the Bell. Angels Gate park (and the bell) is open to the public. Just enter on the park's east side (on Gaffy Street, at West 37th Street), park in the lot, and walk back south - you can't miss the Bell - it dominates the entire hilltop. Here is a photo map link to Angels Gate Park. 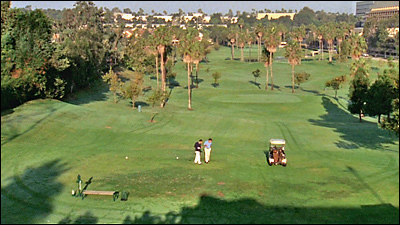 The third location used on the show for the Newport Country Club golf course is right next to The OC's own Manhattan Beach Studios: the Marriott Hotel Golf Course, at 1400 Park View Ave, in Manhattan Beach. It's located right in between the studio and the tennis club. The course is just to the west of the studio, and parts of the studio would be visible from the east side of the golf course. So they keep the camera pointing in other directions. 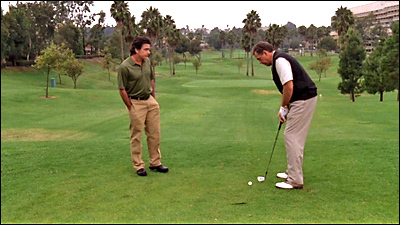 We first see the Marriott golf course in Episode 16 (of Season 2), "Blaze of Glory", when Sandy tries to teach his wife, Kirsten, to play golf (but she isn't very good at it). They seem to have shot this from the northwest part of the course, west of the lakes, with the camera looking west/northwest. We see the Marriott course for the last time in Episode 5 (of Season 4), "The Sleeping Beauty", where Sandy plays golf with Bullit. This is the first time we ever see Bullit. Sandy thanks him for a donation and then sets him up on a date with Julie. They shot this in roughly the same place as the Sandy/Spitz scene. Here is a map link to the Marriott golf course. And here is an aerial photo with the players' positions labeled. A. During the golf scene in Episode 5 (of season one), "The Outsider" (see the large photo above), we catch a glimpse of a building in the background. When I compared this building to photos of the Trump National country club, the match was obvious. The park in San Pedro was a bit trickier. I've been to Angels Gate park before (photographing the Korean Friendship Bell), s the palm tree-lined street seen the background of that scene looked familiar. When I checked aerial photos of the area, the tree-lined street (Paseo del Mar) lined up perfectly to the park. So I drove up there and checked it out in person, and found the identical view, as well as the log pilings shown in another part of the scene.